Tree cabling and bracing support systems can be used to provide supplemental support to tree trunks, limbs and branches that are leaning, old, damaged or otherwise compromised. When a tree has a structural defect or condition that poses a safety risk to people or property, cabling and bracing solutions can drastically reduce future hazard risks. Support systems can greatly help to reduce strain and stress on the tree and also help to further stabilize weakened trees for times of high winds and excess ice or snow weight. Tree cabling and bracing is the installation of flexible steel strand cables and braces in trees to reduce stress damage from high winds, the weight of ice or snow, and heavy foliage. 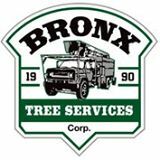 At Bronx Tree Services Corp our goal is to help strengthen weak branches or limbs so that they are better able to withstand severe weather and to improve their longevity and reduce potential risk. Weak limbs are not always obvious, so we will be able to assess your trees and let you know if cabling and bracing is needed. Maintenance following cable and brace installation is minimal but also important, and the hardware should be inspected periodically. At Bronx Tree Sevices Corp we can help provide you expert cabling and bracing services.